Midterm elections are like fancy software: Experts love them, end-users couldn’t care less. But if the 2010 elections are any indication, we might not want to doze off as we head into the summer months before November. Midterm elections at the state level can have tremendous consequences, especially for low-wage workers. What you don’t know can hurt you — or them. In 2010, the Republicans won control of the executive and legislative branches in 11 states (there are now more than 20 such states). Inspired by business groups like the American Legislative Exchange Council (ALEC), the U.S. Chamber of Commerce and the National Association of Manufacturers, they proceeded to rewrite the rules of work, passing legislation designed to enhance the position of employers at the expense of employees. The University of Oregon political scientist Gordon Lafer, who wrote an eye-opening report on this topic last October for the Economic Policy Institute, a liberal think tank in Washington, looked at dozens of bills affecting workers. The legislation involved unemployment insurance, the minimum wage, child labor, collective bargaining, sick days, even meal breaks. Despite frequent Republican claims to be defending local customs and individual liberty, Mr. Lafer found a “cookie-cutter” pattern to their legislation. Not only did it consistently favor employers over workers, it also tilted toward big government over local government. And it often abridged the economic rights of individuals. Take the case of tipped workers and the minimum wage. In most states, tipped workers earn an hourly wage that is less than the federal minimum — the federal subminimum wage for tipped workers is $2.13 per hour — because they’re supposed to make up the rest in tips. (They often don’t; the poverty rate among waiters and waitresses is 250 percent higher than it is among the general work force.) But non-serving staff who don’t get tips must be paid the minimum wage. Republican state legislators have devised a way around that. In 2011, lawmakers in Wyoming introduced a bill that would have allowed restaurants and other employers to force their serving staff to pool their tips; tips would be redistributed among the nonserving staff, who could then be paid the subminimum wage. That same year, Maine legislators passed a bill declaring that “service charges” were not tips at all. Because they aren’t tips, they don’t belong to the serving staff. Employers can pocket them — without informing customers — whether they redistribute them among the staff or keep them. In both cases, conservative Republicans supported the right of employers to take money that workers had earned. This disregard for the earnings of workers is only an extreme manifestation of a more common phenomenon among Republican legislators: their indifference to the problem of wage theft. 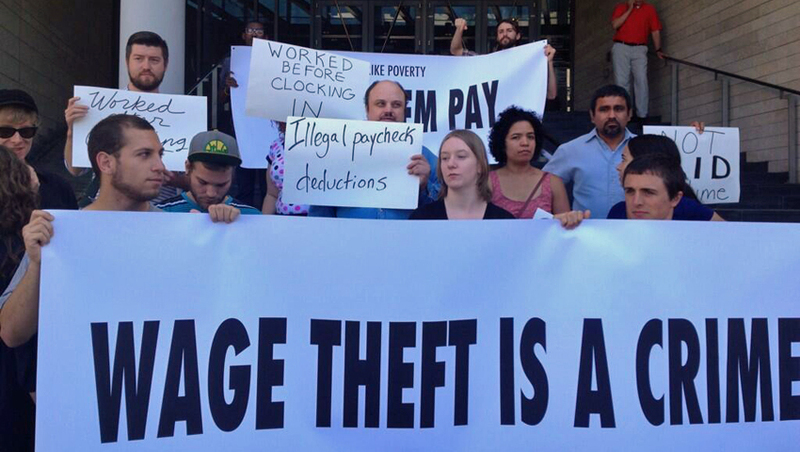 Wage theft refers to the practice among employers of taking money from their employees by illegally paying them less than the minimum wage or not paying them overtime. According to one multicity study, in a single week, nearly two-thirds of low-wage workers had, on average, 15 percent of their pay stolen by their employers. One of the causes of this epidemic of wage theft — which, according to Mr. Lafer’s E.P.I. report, involves sums “far greater than the combined total stolen in all the bank robberies, gas station robberies, and convenience store robberies in the country” — is lax enforcement of the country’s wage and hour laws. In 1941, there was one federal inspector for every 11,000 workers. As of 2008, there was one for every 141,000 workers. “The average employer has just a 0.001 percent chance of being investigated in a given year,” Mr. Lafer estimates. Because there is so little risk of getting caught, one-third of all employers who have been found guilty of violating wage and hour laws continue to do it. In 2010, liberal legislators in Miami-Dade County decided to take matters into their own hands. They passed an anti-wage-theft ordinance, resulting in more than 600 prosecutions and $1.7 million recovered in stolen pay in the first year alone. Miami-Dade’s success inspired Broward and Palm Beach Counties to propose similar measures. In response, Republican legislators in Tallahassee tried to pass a bill that would prohibit any “county, municipality, or political subdivision of the state” from enacting laws, rules, ordinances or regulations “for the purpose of addressing wage theft.” They failed, so they tried again. This time, the bill passed the Florida House, but failed in the Senate. Where conservatives often style themselves as the champions of local control — Ronald Reagan called for a government with “as much law and decision-making authority as possible kept at the local level” — the Florida example suggests that they have no compunction about sacrificing that principle when it threatens business interests. Over the last four decades, for example, low-wage workers have been hit hard by the declining value of the federal minimum wage. In the absence of federal action, states, cities and counties have increased the minimum wage or indexed it to inflation (or both) to ensure that it keep pace with rising costs. Republican politicians in state capitals have tried to check them at every point. Florida, Indiana and Mississippi have banned local governments from increasing the minimum wage. In Nevada, Missouri and Arizona, state legislators tried to overturn constitutional amendments and ballot initiatives. In 2011, New Hampshire’s Republican legislature simply abolished the state’s minimum wage. State legislators have also overridden local efforts to grant employees a right to paid sick days. Nearly 40 percent of private-sector workers have no such right. So Milwaukee and Orange County in Florida tried to establish one within their jurisdictions (as New York City did recently). In Wisconsin, state legislators overturned Milwaukee’s ordinance. In Florida, they simply prohibited any city or county from passing such an ordinance. Other states, including Louisiana and Mississippi, have done the same. Perhaps most surprising is the willingness of Republican legislators to expose the individual to the intrusion and interference of the state. In Tennessee, a bill sponsored by ALEC members that was passed in 2012 stipulated a series of deadlines at which an unemployed worker would have to start accepting a lower-paying job or lose her unemployment benefits. After 13 weeks, she would have to accept any job paying at least 75 percent of her previous wage; after 25 weeks, 70 percent; and after 38 weeks, 65 percent. To ensure compliance with these byzantine regulations (the red tape Republicans so often claim to oppose), the bill required anyone receiving unemployment insurance to submit detailed weekly reports showing that she had applied for at least three jobs per week. It also mandated that the State Department of Labor to audit 1,000 recipients per week. This time, Republicans managed to find the personnel. And if workers don’t learn that lesson in junior high, recent Republican changes to state unemployment codes will ensure that they learn it as adults. In 2011, Florida stipulated that any employee fired for “deliberate violation or disregard of the reasonable standards of behavior which the employer expects” would be ineligible for unemployment benefits. Arkansas passed a similar amendment (“violation of any behavioral policies of the employer”). The following year so did South Carolina (“deliberate violations or disregard of standards of behavior which the employer has the right to expect”) and Tennessee. The upshot of these changes is that any employee breaking the rules of her employer — be they posting comments about work on Facebook, dating a co-worker or an employee from a rival firm, going to the bathroom without permission — can be fired and denied unemployment. Faced with that double penalty, any worker might think twice about crossing her boss. This article originally ran on the New York Times.